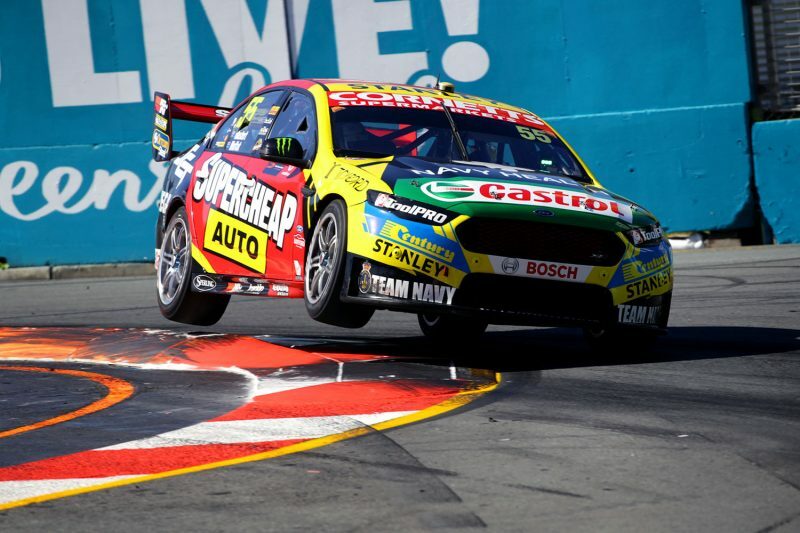 Chaz Mostert has attributed his and James Moffat’s win in the first race of the Vodafone Gold Coast 600 to a ‘really, really different’ set-up direction for the Supercheap Auto Falcon. Mostert qualified fifth for Race 26 of the Virgin Australia Supercars Championship and received the car in the effective race lead after a combination of others’ misfortune and two strong stints from co-driver James Moffat. He took the reins of the #55 Tickford Racing entry with a 2.5s lead over James Courtney and 41 laps remaining, and was able to drive into the distance as the Walkinshaw Andretti United man had to conserve fuel to make the chequered flag. The win was Mostert’s and Tickford’s first since the corresponding race of the 2017, and just the second podium for driver and third for team in the current campaign. The 26-year-old had high praise for not only his co-driver but also engineer Adam De Borre for gambling on a different set-up direction. 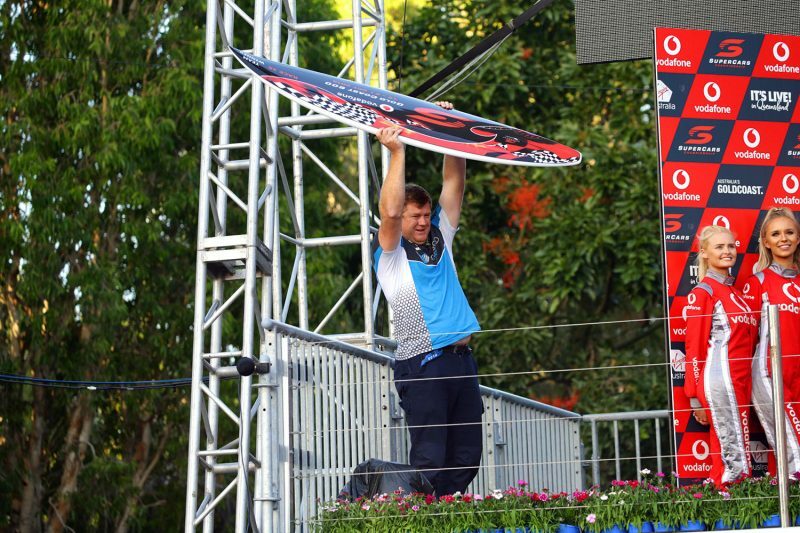 “(I am) Obviously super-pumped for the team; it’s been a very, very tough, challenging year for Tickford, our Supercheap Auto car, and all our guys, it’s been really tough,” said Mostert. “I was actually thinking after Bathurst and seeing the way we went at Sandown (that) it was going to be quite tricky to get this guy (Moffat) a trophy in this enduro season but I give a lot of credit to Adam De Borre. “He really decided to try something different this weekend and it seemed to work pretty well, so overall I’m pretty happy with the car (but we have) still got a fair bit of work to do on it. Mostert said that the gains seemed more pronounced given his level of pessimism about their Gold Coast prospects, but cautioned against talk of a turnaround just yet. “I’d like to hope so,” he commented on the prospect of more solid results to round off the season. “I think this track was probably one of the biggest ones we were worried about with how our year has been going and some of the deficiencies we were seeing in the car throughout the year, but I don’t know, you can’t really comment on it. “Today the car could have really suited the track or the conditions and the track could grip up more again tomorrow and it might not be as quick; you just don’t know. “This weekend’s pretty much the first real crack at trying something really, really different and time will tell, but for me it’s just amazing not to just get a third but actually have some pace to get the win today. Tickford’s other cars recorded results of seventh (Mark Winterbottom/Dean Canto), eighth (Cameron Waters/David Russell), and a DNF (Steve Owen), which team principal Tim Edwards believes vindicates the squad’s hard work. “Two other cars in the (top) 10 as well, so I think it’s a good confidence booster for everybody,” he told Speedcafe.com. “At the end of the day, there’s nobody in this team who has actually been comfortable or not frustrated with our results. “We’ve been working our arse off; irrespective of what the media say, irrespective of what the public say, we haven’t been happy with our performance. “We’re not going ‘We’ll wait ‘til Mustang and that will fix everything’, we’ve been working our arses off with everything else about the car. “Don’t forget, what underpins these cars underpins the Mustang next year. Mostert remains sixth in the championship but has now put 84 points between himself and seventh-placed Fabian Coulthard after starting the weekend six clear of the DJR Team Penske driver.